National Motorcycle Museum, UK (August 2003) Page 1 of 3. 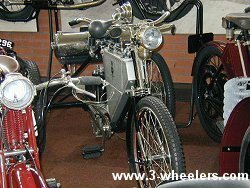 On August 31st 2003 I visited the National Motorcycle museum near Birmingham (UK) though due to taking the wrong smart media for my camera had to take all photos in SQ (standard quality mode) rather than HQ (High Quality) which I usually use. As a result I contacted the museum who kindly invited me back with greater access to the 3-wheelers (and the correct smart media in my camera) and so I phoned to make arrangements but then disaster struck. The day after my call the museum was almost totally destroyed by fire with hundreds of the motorcycles in there going up in flames. My condolences go to the museum and I wish I could help them out in some way. Baring in my that I could only take low-resolution photos here are my photos from the day. Whether the vehicles in these photographs still exist I do not know! Where possible the data supplied with these photos comes from the information plaques that were next to the vehicles. 3-wheelers at the National Motorcycle Museum, UK (August 2003). 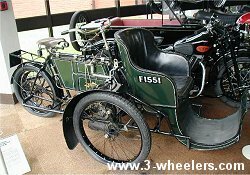 The Quadrant was first brought out at the end of 1903 as a single speed machine and was one of several makes of forecar that enjoyed a run of popularity at that time. Manufacturer: The Quadrant Cycle Co., Sheepcoat Street, Birmingham. UK. 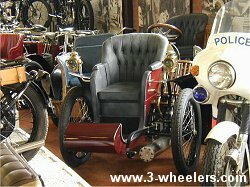 1898 Ariel Tricycle 2 1/4 H.P. 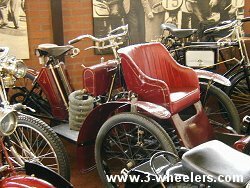 Owned by the BSA group the Ariel Tricycle was produced from 1898, the frame of the tricycle was extended at the rear so that the engine could be mounted ahead of the rear axle to help distribute weight. 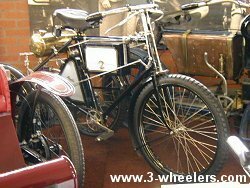 The Raleighette was produced from 1903 and was powered by a 3.5 H.P. water cooled engine. This trike made at Beeston cycle works on the outskirts of Nottingham was one of the first and regarded as the best of the type. Morever one like this was the only motorcycle to make it from London to Brighton in the Emancipation Day Run to celebrate the raising of the speed limit to 12 mph in 1896. Two years later the Duke of York, later to be King George V became the first royal to ride one. The National Forecar car be regarded as ond of the most extravagant of the type. It follow popular lines but scores a first with its water cooled twin engine which has four valves, two side exhaust and two atmospheric (suction) inlet valves. The imposing brass half moon styled structure behind the passenger is a combined water tank for the cooling system topped by the petrol tank which has a simple gauge to indicate the contents.